The nation’s more than 40,000 federal airport security screeners hope 2017 will be the year they finally receive the same protections as federal employees in other government agencies—and their bosses. Reps. Bennie Thompson, D-Miss., and Nita Lowey, D-N.Y., introduced the Rights for Transportation Security Officers Act (H.R. 2309) Wednesday, a bill that would bring front line employees of the Transportation Security Administration into the fold of federal workers covered under Title 5 of the U.S. Code. Title 5 includes protections like expanded collective bargaining rights, due process and access to the General Schedule pay scale. It has been a long fight so far for TSOs, who have had union representation since 2011 but have been exempted from Title 5 protections since the agency was first formed following the September 11, 2001, terrorist attacks. They came closest in 2007, when the House and Senate both included a provision offering the protections in the Implementing Recommendations of the 9/11 Commission Act, but the language was stripped in conference committee following a veto threat from President George W. Bush. 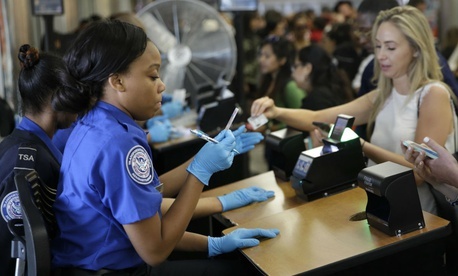 Charity Wilson, legislative representative for the American Federation of Government Employees, said since the TSA’s founding, front-line officers have been given fewer rights than other federal workers. Wilson said granting Title 5 status to screeners also would allow them to appeal workplace decisions to the Merit Systems Protection Board. She noted that while transportation security officers are not covered under Title 5, most administrative and managerial jobs at TSA do have those rights. Last year, the House Oversight and Government Reform Committee held a hearing to discuss high attrition rates and a toxic culture at the agency. Chairman Rep. Jason Chaffetz, R-Utah, said at the time that 104 screeners were leaving TSA each week. Thompson said the lack of Title 5 protections for transportation security officers has hampered the agency’s ability to fulfill its mission. Wilson and other union leaders hope the strong performance of screening officers last year, when a staffing deficit led to fears of long lines and missed flights across the country, will convince lawmakers to come together on this issue. Last year, Thompson and Lowey introduced similar legislation, but it died in committee. Also included in the bill are protections to ensure that as TSOs move onto the GS pay scale, none are placed at a level lower than their current wage. The legislation has been referred to the House Homeland Security and the House Oversight and Government Reform committees.